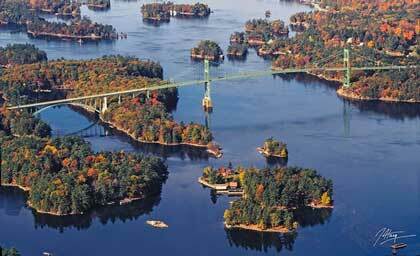 Two of my favourite Ontario drives are found in the 1000 Islands. Hwy. 2 is the old stagecoach road between Montreal and Toronto and the 1000 Islands Parkway hugs the St. Lawrence River between Brockville and Gananoque. Both routes take you to the town of Gananoque, a riverside community dating back to the late 1700s. The 1000 Islands is also where you’ll find two Resorts of Ontario properties – the Gananoque Inn and the Glen House Resort. [caption id="attachment_181" align="aligncenter" caption="View of the 1000 Islands area from the air."] [/caption] Originally built as a carriage factory, the Gananoque Inn first began welcoming guests in 1896. It was a heady time for the 1000 Islands, which was fast becoming a summer playground for the rich and famous. Millionaires like George Boldt, owner of New York City's Waldorf Astoria hotel, and the Singer family of Singer sewing machine fame were building their palatial homes back then. The area was becoming known as the “Venice of the North”. [caption id="attachment_182" align="aligncenter" caption="The Gananoque Inn has been welcoming guests in the 1000 Islands since 1896."] 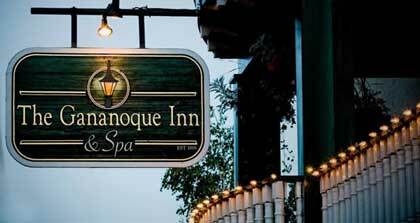 [/caption] Today, the Gananoque Inn is a relaxed place to spend a couple of days. I stayed here a while back with a British TV crew that was scouting locations for a Survivor-type TV show. I’ll always remember the crew and my first meeting with Chad, a survival expert who ran a wilderness school in the wilds of eastern Ontario. In the parking lot of the Gananoque Inn Chad wowed the British TV crew (and me too) by rubbing two sticks together and igniting a small handfull of dried bullrush in a matter of seconds. He was hired on the spot as the outdoor resource guy. During our five-day stay at the Inn, the crew and I ate most of our meals on the fab deck overlooking the St. Lawrence River and the Gananoque Boat Lines. The Gananoque Inn is also just down the street from the 1000 Islands Playhouse. Many theatre-goers arrive by boat at its two theatres, one a 1909 canoe club, and the other an old fire hall. [caption id="attachment_183" align="aligncenter" caption="The Glen House Resort in the 1000 Islands of Ontario."] 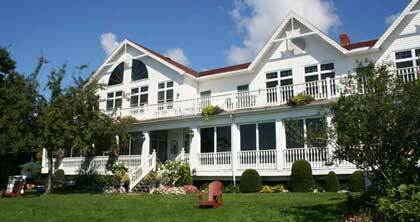 [/caption] The Glen House Resort is on a picturesque piece of St. Lawrence riverfront just east of Gananoque. Its idyllic setting is popular with wedding parties and often families will book the entire resort for their celebration. 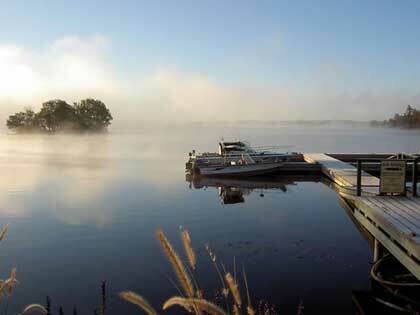 The resort has a 180 degree view of the St. Lawrence at one of the river's widest points. You can explore the waterway in a Glen House boat, canoe or kayak, or for landlubbers, bicycles are available for cycling on the path along the parkway. I'm itching to play the resort's Smuggler’s Glen, a championship 18 holes that has had rave reviews. I checked, and the Glen House Resort has some great mid-week and weekend golf deals for it.